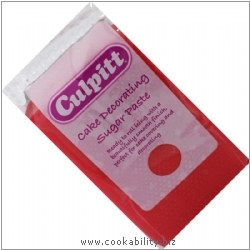 Cake decorating sugar paste. Ready to roll icing with a beautifully smooth finish. Perfect for cake covering and decorating. Ingredients: Sugar, Glucose Syrup, Palm Oil, Water, Humectant E422, Emulsifier E472c, Natural Flavouring, Preservative E202, Colour E129. Stabilisers E415, E466. May contain traces of nuts. E129 may have an adverse effect on activity and attention in children.